Note: Any delay or lag is due to bad video compression and not the algorithm itself. The project “Audio Detection” was part of the M.A. Intermedia Design, at Trier University of Applied Sciences, as an external project. The aim of the project is to combine understanding and skills from the three areas of design, sound and computer science and to work out a verifiable end result. The basic functionality of the developed application is to play and analyze any songs of a user and a visual scene, which adapts dynamically and in real time according to the results of the analysis, without the user having to give further input. However, if the user wants to adjust some settings that serve the application as a kind of frame, he can do so via an additional interface. So-called “onsets” are determined by a recognition algorithm in conjunction with Fast Fourier Transformations and ultimately serve as an event to control visual effects. 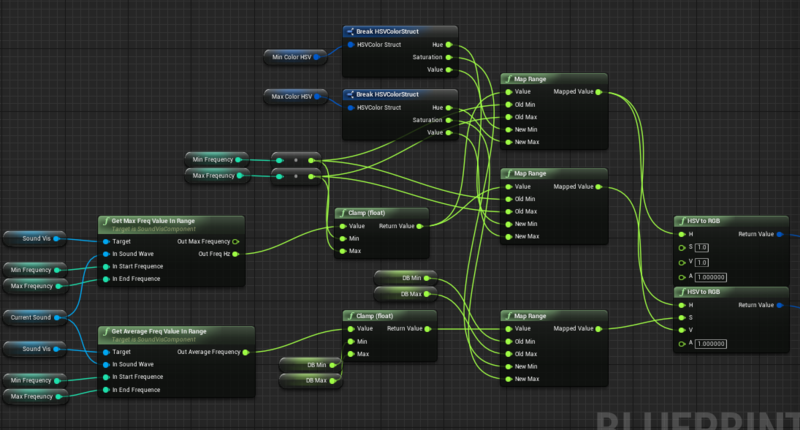 The project was implemented in the Unreal Engine 4.18, basic audio analysis capabilities in C ++ and all the complementary features in the engine’s own blueprint system. To further enhance performance for real time usage, the algorithm is supported by Nvidia’s CUDA gpu accelerated FFT libraries. Onset: A moment marking the beginning of a transient or note. Transient: Short interval during which the signal behaves in a relatively unpredictable way. 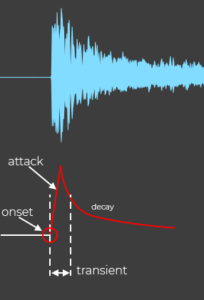 Attack: The time interval in which the envelope of the amplitude increases. X (k, n) is the kth ‘frequency block’ of the nth frame. The Fourier transform often causes a so-called leak effect, which arises because a continuous signal is divided into finite frequency blocks. The mentioned Hann window function w (m) is here an appropriate method to weight the sampling of the signal and to “fade in and out” in the window area. where p is the order of how many past frames are considered of the LP model and a_k are the coefficients of the prediction. The next step is the calculation of these coefficients. In the literature, the so-called Burg algorithm is used for this, but at this point the precise functioning of the algorithm should be dispensed with in order to provide a deeper insight into the visual implementation of the project. 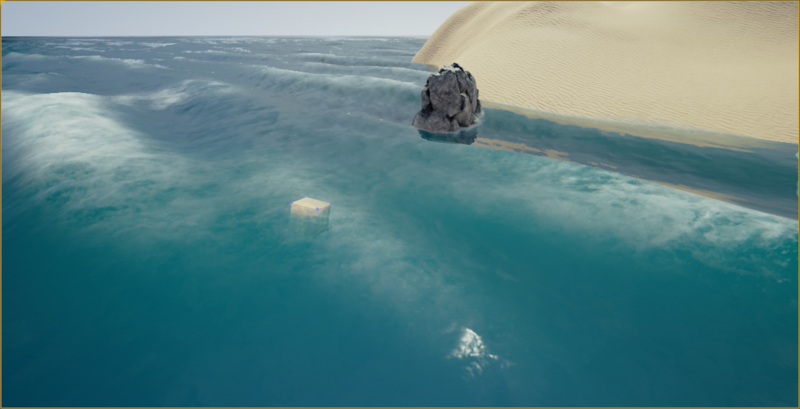 Although this adds significantly more computations per frame, the algorithm can still accommodate real-time needs. How much the LP model influences the effort of the calculations depends on how high the order p of the model is chosen. The basic goal of the visualization for this project was to illustrate the results of the underlying algorithm to the user on an artistic basis. The previously explained onsets serve as events to control visual effects. All reactive elements of the visualization are colored on a dynamic basis according to their defined frequency range. This process uses a combination of the maximum hertz and amplitude values ​​and the average of the amplitude values ​​of the actor’s own frequency range of the current detection cycle. 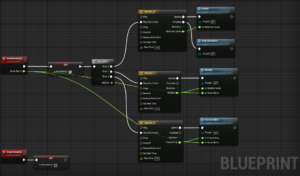 These values ​​are entered in the HSV (Hue-Saturation-Value) range with min. and max. 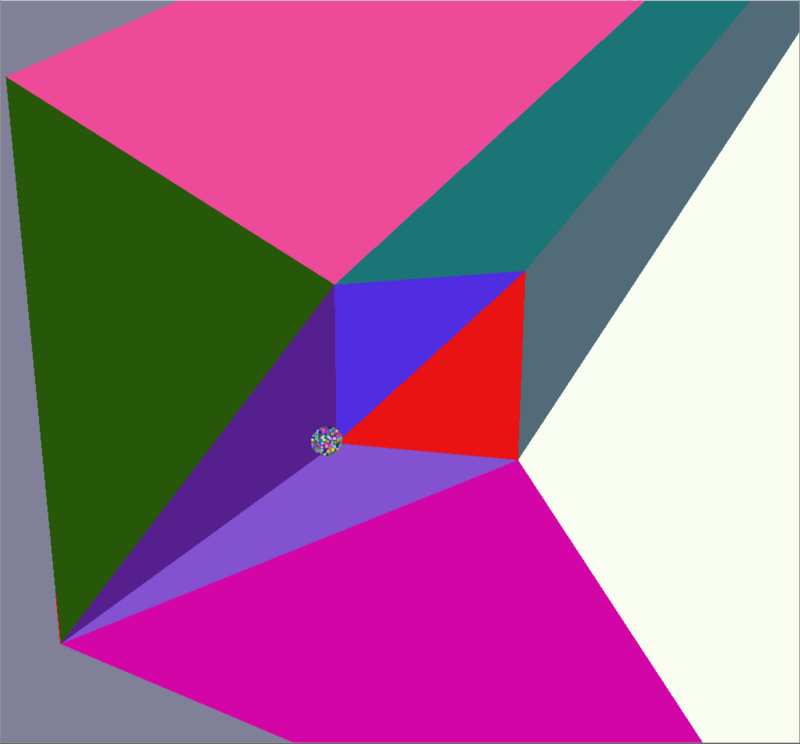 restrictions and then passed as RGB (Red-Green-Blue) value to the shader of the Actors. The frequency (Hz) with the maximum amplitude of the range, determines here the Hue value, which color the Actor assumes, the maximum amplitude value the Value value, thus how strongly the Actor shines and the average of all amplitudes in the range, the Saturation Value, the saturation of the color. 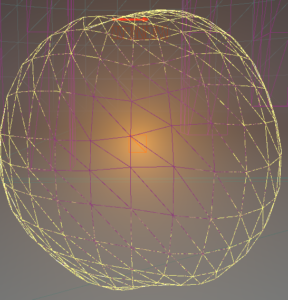 2. wobble effect: The “wobble” effect shows how the individual vertices of the 3D sphere model move when an onset occurs. How strong this effect is is scaled with the normalized onset value. 3. 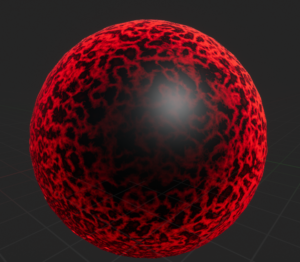 Rotation effect: In addition to the wobble effect mentioned above, the Sphere Actor will be rotated by a certain amount every time it is turned on, boosting the wobble effect and adding more dynamics to the movement. 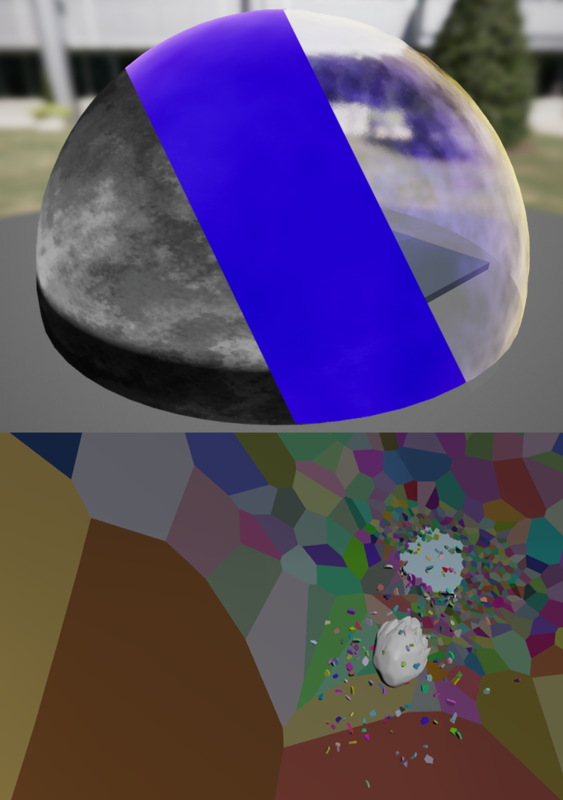 In addition, the rotation moves the vertices of the sphere over the noise texture that is in Worldspace (ie the texture is not mapped to the model’s local UV coordinates and is independent of them), giving the viewer the impression that as if small waves were running over the sphere as soon as an onset occurs. 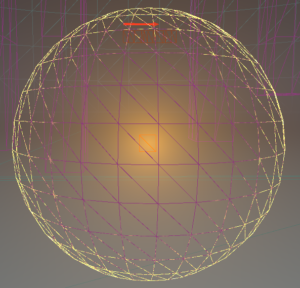 As a shell, the Sphere Actor surrounds a particle system in the form of a bubble. These particles respond to found onsets by moving away from the sphere and then pulling back together. The animation of the particles works via World Position Offset and is calculated with a time variable in conjunction with a sine function, so that the movement of the particles can be efficiently calculated and yet are smooth. As a local starting point for this movement, serves an “Attraction Point”, a point from which the particles drift away and then move back to. Thus, a kind of artificial physical force is visualized. 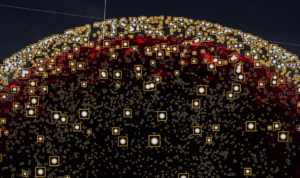 How much the particles move away from this point is controlled by the current, normalized onset value. The rest of the scene effects are more or less set up in the same way. In conclusion, it can be said that the original intention of analyzing an audio track and visually presenting these results has been achieved. The visual representation may be customized for future use as long as it is based on the results of the onset detection or the frequency data of the audio track. Through the implemented interface, the user has enough options to adjust the scene according to his color ideas.